Buxton, who were chasing their fourth win, are ninth in the table after their sixth defeat in a bruising encounter at Sunnyfields. Coach Karl de Groot praised his side for their efforts against the top-of-the-table visitors. “I thought the boys were magnificent,” he said. De Groot said the results needed to be put into context to show how well his side had done. 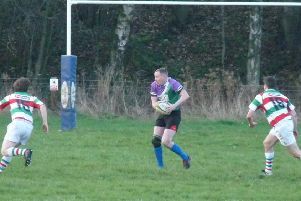 “They (Long Eaton) are coached by two Nottingham full-time professionals and are running three sides weekly with academy players featuring,” the coach pointed out. “We, on the other hand, are finding it difficult to field one side, resulting in a mixed bag of players turning out every week, in differing positions. “So the result and performance waso testament to our players’ quality. “We were competitive all afternoon and could have nicked the game at the end. De Groot said his side were were praised afterwards by the opposition coaching team for being one of best sides they have played. “The players should take that I think and move on with a spring in their step,” he added. Long Eaton, who have eight wins from nine matches, have been a difficult side for anyone to contain this season, racking up an average of 45 points a game and conceding only 15 tries. Yet the Stags dominated long periods of a game that could have gone either way. There was an early score a piece, resulting in a half-time lead of 12-8 for the visitors. Long Eaton extended the lead shortly after the break with a catch and drive from 15 metres out, but the Stags responding with a penalty. There was a further try apiece as the game ended at 24-18. Long Eaton’s Chris Brookes said Buxton’s performance belied their position. “One of our favourite clubs, Karl de Groot’s Buxton are never an easy place to visit,” he said. Buxton Stags next match is at sixth-placed Mansfield on 25th November. Mansfield have been beaten three times in their eight matches.